Freshman Taylor Dedmen led the way for the Govs with an opening-round 75, including a 4.75/hole average on par-5 attempts that didn’t just lead the Govs, it was one shot off the lead for the tournament. She canned two of Austin Peay’s four first-round birdies, on the par-5 No. 8 and par-4 No. 14. 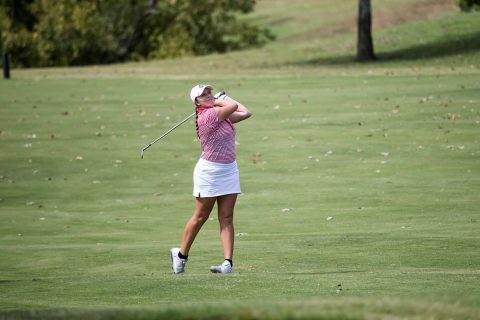 Austin Peay’s next two finishers sank the Governors other two birdies. Freshman Shelby Darnell acquitted herself nicely with a career-opening 77, while senior Taylor Goodley chipped in with a 79, including a birdie on the first hole of her final collegiate season. Sophomore Riley Cooper and senior Ashton Goodley look to rally back on Monday after carding an 86 and an 87, respectively, in their fall-opening rounds. The Govs tee off beginning 7:30am (CT), Monday, paired Valparaiso and a collection of individuals.